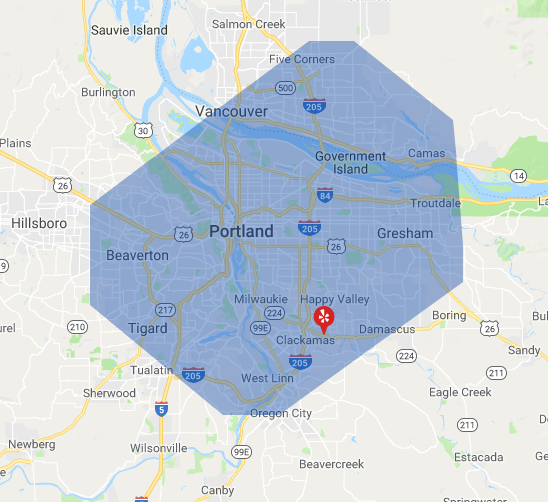 We will service your property every-other week (bi-weekly) year round. All the services we do throughout the year are added up and divided by 12 months, equaling the same monthly payment each month. All services included above will be performed as needed. We bill our invoices via email, the next month for the previous month’s service. Our invoices are sent out on the 1st of each month, and are due by the 11th of each month. You can either pay online once you receive the Invoice (Just click the “pay now” button on the Invoice) or send us a check in the mail to the address on the Invoice. We will make sure your property looks clean and manicured after each service. If at anytime you feel like that’s not the case then please let us know immediately. Simply fill-out the free estimate form or give us a call to get a free estimate for your property! Core aeration is the process of removing small plugs of thatch and soil from the lawn to improve air flow in the soil. Aeration enhances water intake, improves fertilizer uptake and use, reduces water runoff and puddling, encourages root growth, and reduces soil compaction. Overall this procedure will make the lawn a lot healthier and save money on your water bill. Thatching increases the amount of water and nutrients available for your lawn to consume. As thatch accumulates, it prevents water, nutrients, sunlight and air from reaching the roots of the grass. When this occurs, the grass is suffocated and starved, promoting an unhealthy and unsightly lawn. While a thin layer of thatch is beneficial to your lawn, protecting it from extreme weather and traffic, an excessive layer is damaging. Simply explained, lawn overseeding is a process of spreading grass seed over the already existing turf. 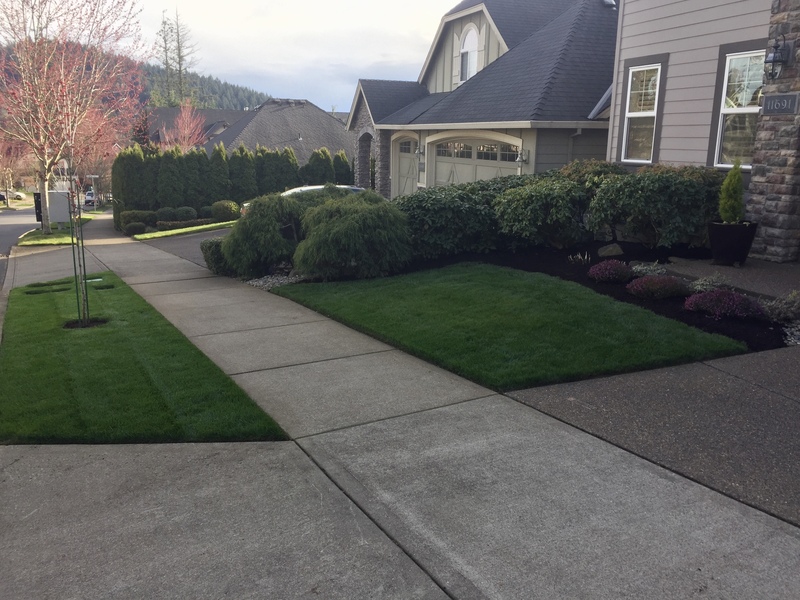 It is good for lawns that suffer from drought stress, insect or disease damage, or that show other evidences of decline, such as bare patches. Overseeding a lawn with newer, improved types of grass is often the best way to thicken the lawn and improve its health and appearance. 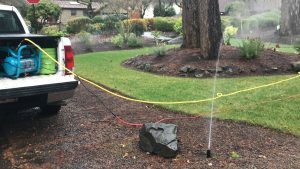 We offer a sprinkler system startup service in the Spring, where we activate the sprinkler system, inspect the entire system, and program the timer. We make minor adjustments and tune the sprinkler heads at that time as well, to insure proper coverage. 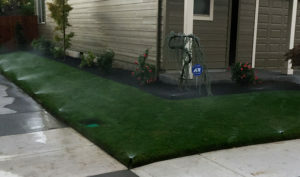 In the Fall we offer a winterization service for your sprinkler system. We blow out all water with compressed air insuring that pipes, valves and all components of the system are safe from freezing in the winter. 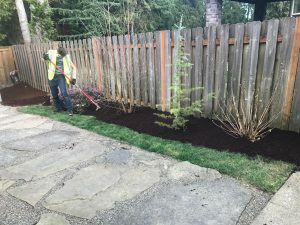 Besides the beautification and enhancement of a property’s image, barkdust or mulch serves as the first line of defense against a number of pests that may attempt to invade. It also provides a protective layering that conserves water by reducing water evaporation. And finally it serves as a powerful weed and moss control agent. We use only quality bark products and have a large variety to choose from to meet our client’s needs. Do you offer weekly service? No, we only offer bi-weekly (every-other week) service. Do you offer temporary month-to-month or seasonal service? No, we only offer a year-round service. What do you do in the winter months when stuff is not growing? We still come out to your property and blow all hard surfaces, mow if needed, trim bushes if needed. Many times there are branches and debris from wind storms also, as well as winter weeds. We do less work in the winter, but a lot more in the spring with everything growing fast and in the fall with leaves so it basically balances out throughout the year. Our average price is $120-$180/mo for a standard sized lot up to 8,000 square feet. The price varies on how many shrubs, how big is the lawn, what size property, location, etc. Please contact us for a free quote for your property. Do you offer organic maintenance? No, we do not offer organic options for landscape maintenance. Yes, we accept credit cards for our landscape maintenance service.